It’s time to unveil my recipe for brussels sprouts! It’s the season for these little veggie balls. Trader Joe’s is finally starting to sell the sprouts on stalks again! I never understood why people don’t like brussels sprouts. If you buy an old batch, they can be a bit bitter, but with a bit of seasoning, the little cabbage balls can be so scrumptious. My mom never made me brussels sprouts growing up, so that could be another reason why I love them so much. I call this recipe my Fat Girl Brussels Sprouts because there’s bacon in it. And who doesn’t love bacon? Bacon makes everything good. Duh! 1. Pre-heat the oven to 350° F.
2. Cut up the sprouts into bite size pieces. For the smaller ones, I halve. For the bigger sprouts, I cut into quarters. Try to fluff up the leaves a bit with your fingers. Place them into a big mixing bowl. 3. 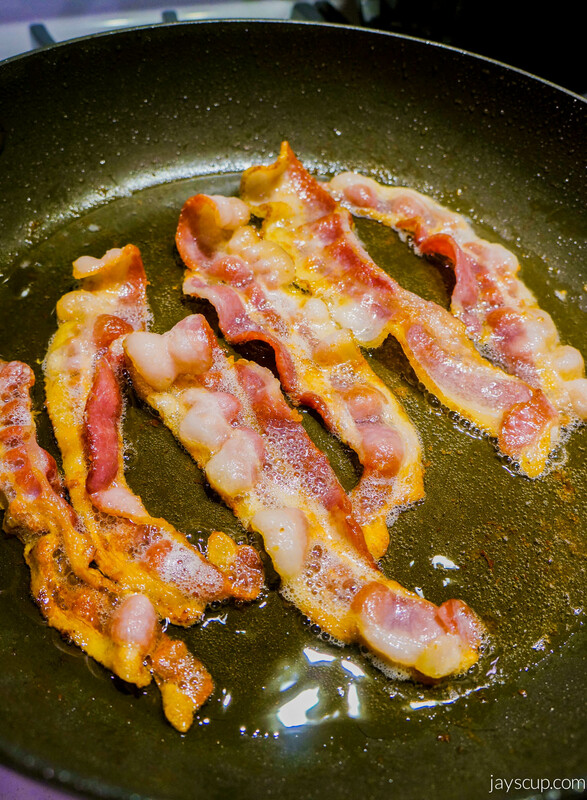 Cook the bacon in a pan until crispy. 4. As the bacon is cooking, mince the garlic onto the brussels sprouts. 5. Once the bacon is cooked, cool them until you can break the bacon into small pieces into your mixing bowl. Should be easy to do with your hands since the bacon is crispy. 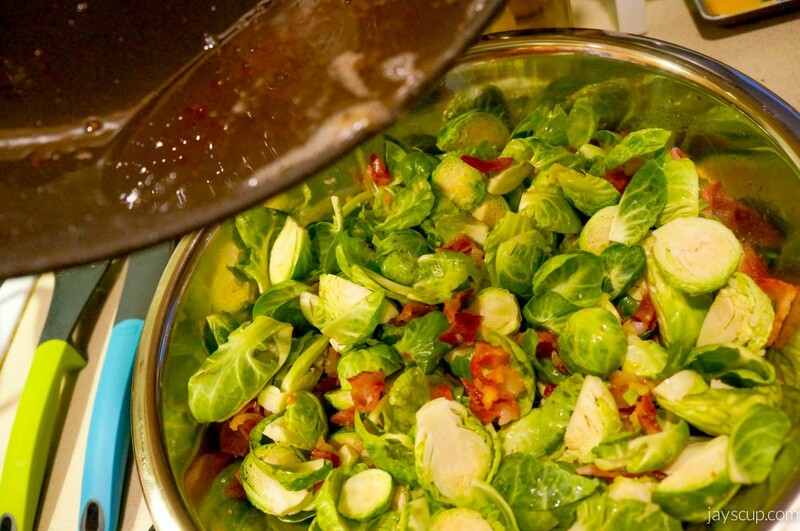 Then pour the bacon oil into the mixing bowl (that’s why it’s my fat girl brussels sprouts!). 6. 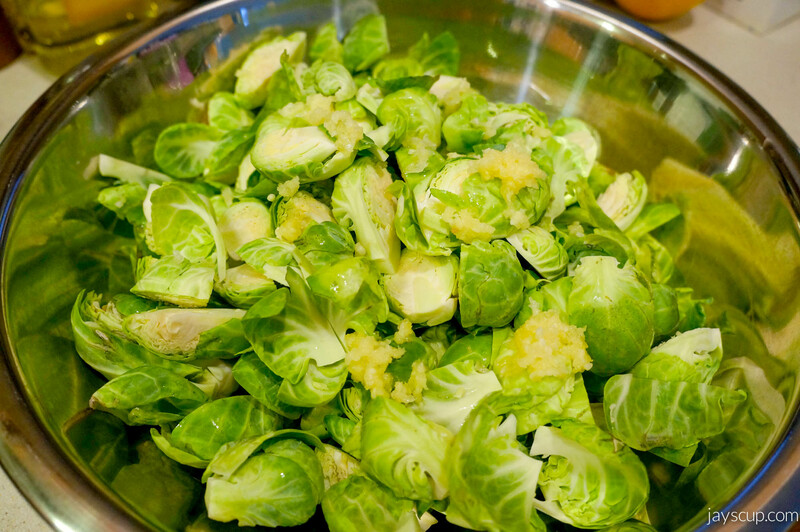 Mix all the ingredients in your bowl until the sprouts are thoroughly coated with the oil. The oil may still be hot so be careful when mixing! 7. Now place parchment paper on a baking pan, and place all ingredients onto the pan evenly. Then put the pan into the oven for 40 minutes (time may vary as oven are all made differently). Basically, bake until brussels sprouts are soft on the inside. 8. 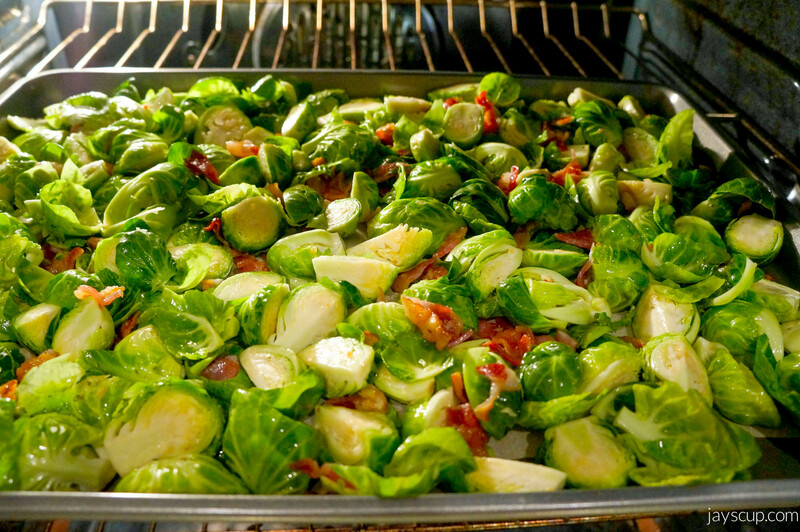 Now broil the brussels sprouts in the oven for 2-3 minutes, until the leaves are golden brown and crispy. Mince the garlic into the mixing bowl. Pour in the bacon oil and mix all the ingredients together! Yes, they are cooked with bacon oil, but this is a veggie so it’s healthy right? 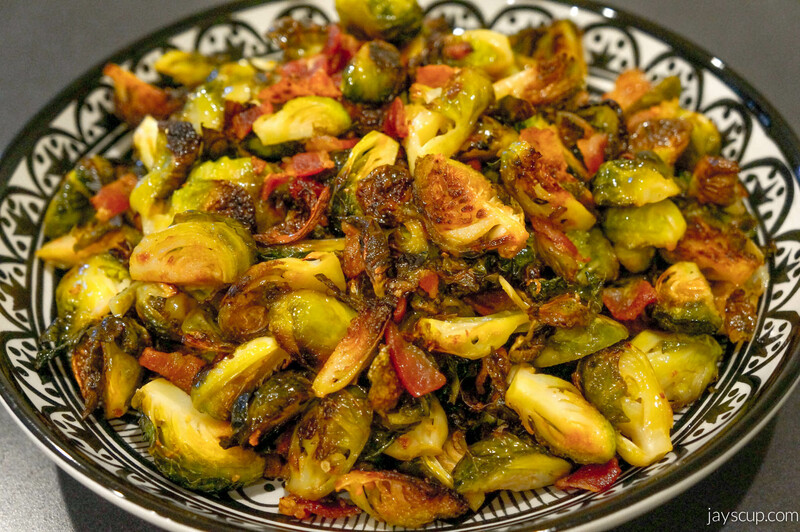 I promise that you’ll like brussels sprouts if you make this recipe. 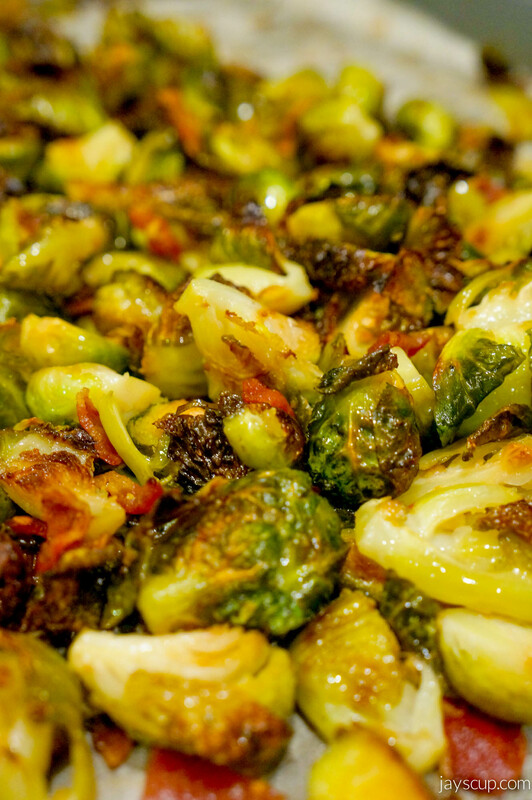 How do you feel about brussels sprouts? Is this something you’re going to try? Are you hungry yet? This entry was posted in Food & Recipes and tagged bacon, bake, brussels sprouts, food, recipe, recipes, sprouts, vegetable, veggies. Bookmark the permalink.